Yan-o-pah, photo by Harold Davis. View this photograph larger. 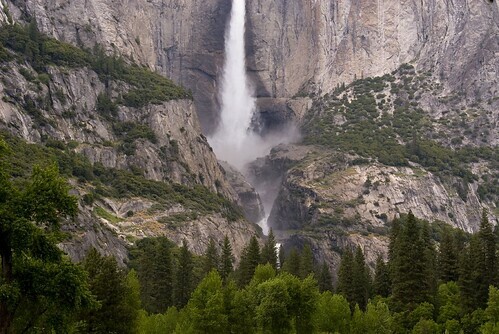 Every view in Yosemite Valley has probably been photographed, and most views more than once. 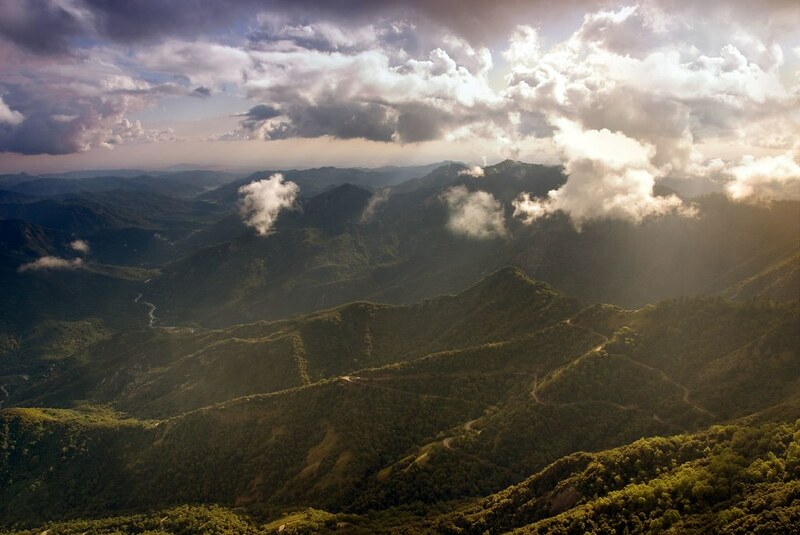 The famous vistas have been photographed a great many times. For example, there’s a classic Ansel Adams view of Vernal Falls that must have been taken from very close to my position when I took the photo shown above a few days ago. These days one of the biggest challenges as a photographer in Yosemite is fighting one’s way through the groups of photographers that can block the famous locations. For example, it is impossible to visit Tunnel View in the afternoon without finding a horde of fifty or so photographers with tripods. Most of the images that all these photographers take (my own and Ansel Adams’s included) portray a view of unspoiled nature. The very fact that these phorographers come in packs shows this for a lie—Yosemite is not empty and unspoiled nature, it is filled with people including other photographers. By the way, the obsession with photographing Yosemite goes way back—more or less to the European discovery of the valley. A few years after its “discovery” there were already competing photographers in the valley, for example Eadweard Muybridge and Carleton Watkins struggling to produce the most impressive wet-plate vistas during the same season in the valley in 1872. People have always lived in Yosemite. The fact is that the Miwoks lived in Yosemite Valley, but were rapidly pushed out to make way for tourism. Today, employees of the National Park Service and the Delaware North Corporation (the park concessionaire) live in the valley. As far as I am concerned it is no consolation, but you can view the recreation of a Miwok village at the Yosemite museum, along with some waxworks models of what the Miwok may have looked like. I’ve already remarked that I despise the naming of the great trees of Yosemite and Sequoia after our generals of war. Essentially, this kind of naming is an act of cultural imperialism, along with blanking-out the Miwok names. 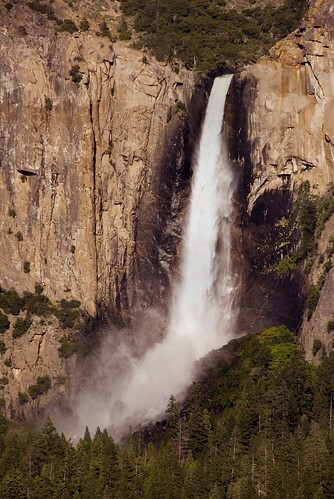 As far as that goes, I like “Spirit of the Wind” as a name much better than the Victorian, vaguely insipid, Bridalveil Falls. The waterfall does seem to respond to the vagaries of the wind. It is the spirit of the wind, and it is no bride’s veil I have ever seen. To Muybridge’s credit, he seems to used Miwok place names in his Yosemite photographs in a polemical fashion, and a number of his photographs do feature the Miwok doing their natural thing, rather than the unpeopled grandeur of “natural” Yosemite, or another variation on the noble savage theme. Muybridge’s “Pi-Wi-Ack, Valley of the Yosemite,” taken in 1872, shows the top of Vernal Falls without the massive fence it has today, and without people. You can see a small reproduction of this photograph in this San Francisco Chronicle article, and a larger reproduction in Rebecca Solnit’s execellent critical biography of Eadweard Muybridge, River of Shadows. As Muybridge was a murderer—he shot his wife’s lover at point blank range in the heart—and an inventor—of what more or less became motion picture technology—his life makes interesting reading even without the photography. The last of the great classic trinity of waterfall photographic subjects in Yosemite is Cho-Lack to the Miwok, and Yosemite Falls to us. Once again, the meaning of Cho-Lack is as lost (at least to me) as the water that rushes down the Merced to the great San Francisco Bay. Here’s a photo of Cho-Lack I took recently, with my digital camera on a tripod and a long exposure to create a continuous, white flowing effect for the motion of water—like that used perforce by the great nineteenth century photographers, because they had no choice, and their exposures had to be long. The editing out of people and their artifacts was accomplished with framing, not via Photoshop. Butterflies on a Sock above Vernal Falls, photo by Harold Davis. View this photograph larger. After climbing the Mist Trail, we were thoroughly soaked. The great rock platform on top of Vernal Falls, and between the falls and the Silver Apron, has been included in numerous photographs for over a century, and of course many photos are taken from this area. On this beautiful and graceful granite ledge, with a view stretching for miles across Yosemite Valley, we took off our wet things and dried our clothes (and ourselves) in the sun. For some reason, these butterflies were attracted to Julian’s socks. Was it the sock nectar? 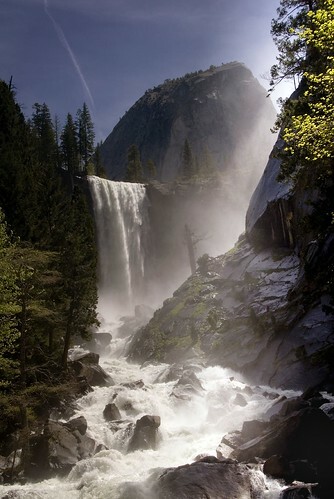 And, what did you photograph from the classic, iconic spot above Vernal Falls, Daddy? 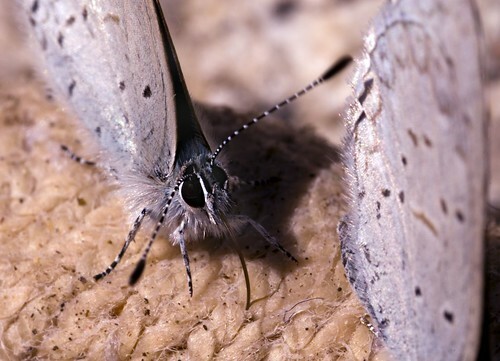 Why, some insects on some wet and dirty socks, of course! Go figure, photographers are just weird. So are butterflies. 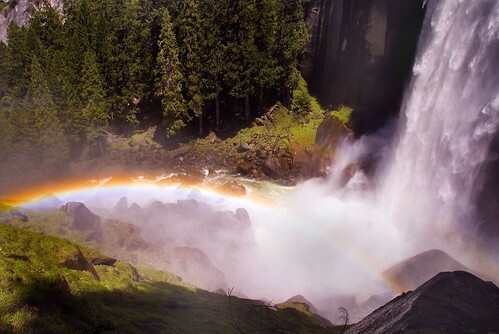 Rainbow on the Mist Trail, photo by Harold Davis. View this photograph larger. Part of the fun of climbing the stairs of the Mist Trail to the top of Vernal Falls is getting completely, absolutely soaking wet. (So take note and protect your photographic gear appropriately.) 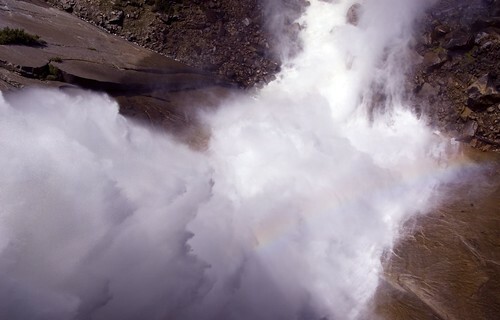 At least in the spring and early summer, when the water flow runs high. 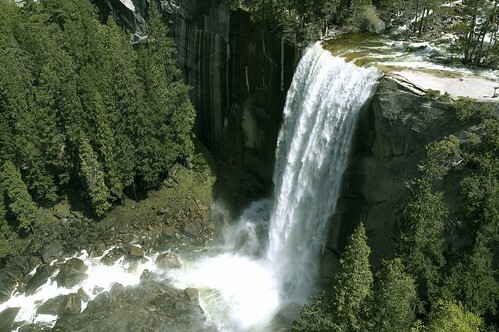 Things are tamer towards the end of the summer and into autumn, although unlike some of the falls Vernal runs year-round, as you can see in this autumn photo of Vernal Falls. Another part of the fun is catching sight of the rainbows that always hover around this place. 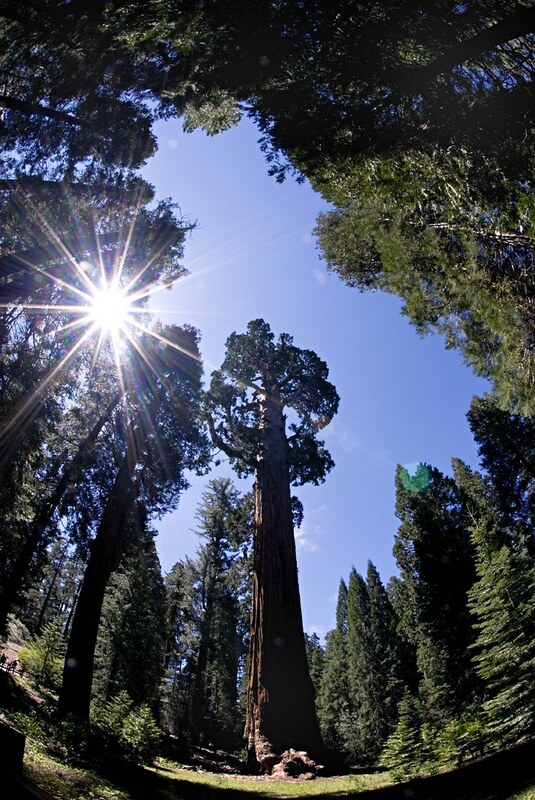 We tend to think of Yosemite as “big nature” at its most iconic–untouched and superb. It’s a fact of politics that the Yosemite enclave is in fact pretty trammelled, although in some ways well preserved. Yosemite is branded nature with a “platform” in a unique way. Among American landmarks in nature, perhaps only the Grand Canyon has similar status. If you including constructed landmarks, the short list might also include the Statue of Liberty and the Golden Gate Bridge. Each of these things (or places) represents something to people, where or not the thing or place really matches its iconography. 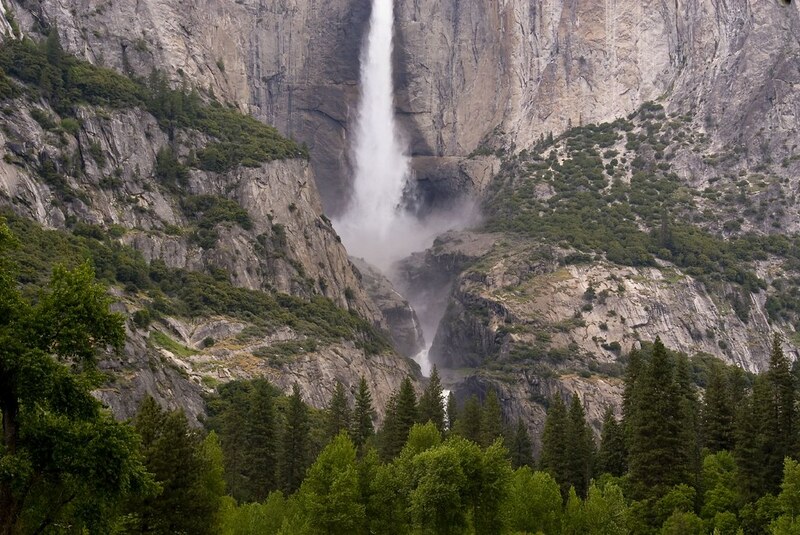 Similarly, good photos of Yosemite are often artificial in some way. The artifice is used to make the photo look natural. In this photo from the along the Mist Trail, and the photo below of looking down Nevada Falls, I used Photoshop to preserve the tonality of the very bright water while bringing out the colors in the rainbow a bit. I did this by double-processing the RAW files, adding a layer mask, and “painting” in the rainbow from the darker exposure. 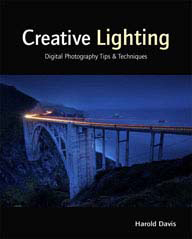 Raise High the ISO, Digital Photographic Craftspeople! 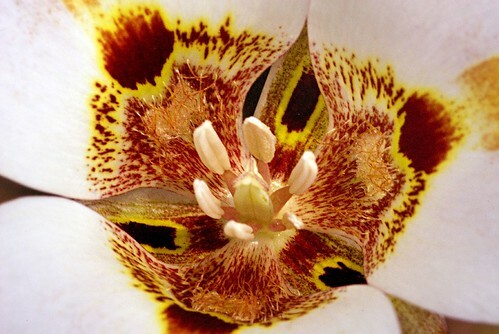 Calochortus, photo by Harold Davis. View this photograph larger. 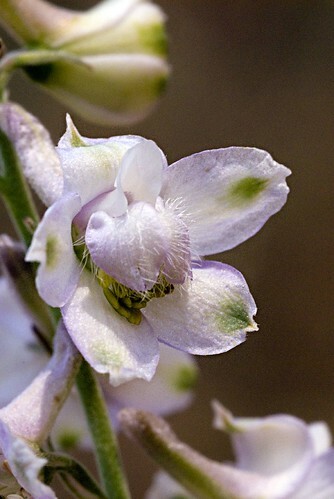 Wild flowers—like the Calochortus above, also sometimes called a Mariposa Lily—grow along Hite’s Cove Trail above the South Fork of the Merced River off Route 140 and the Merced Canyon. Mid-April through mid-May is the best time for a visit. The trail is about one foot wide, and winds high above a precipitous drop to the river. The path is dotted with poison oak as well as wild flowers. On my recent trip, there was a high wind and I was with Julian, my eight-year-old who was tired from hiking Yosemite but still constantly in motion. In other words, this was no time for serenely setting up a tripod on a gentle, level field of flowers. 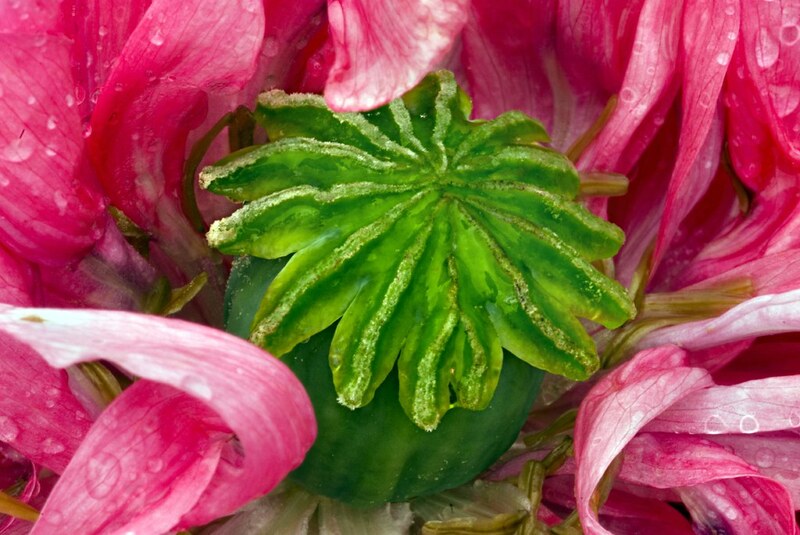 Some kinds of photography, mostly indoors in a studio, can be effectively and rigidly controlled. My kind of photography cannot, which is part of what I like about it. My theory about the kind of photography I do is that it is like a knight’s quest: I start out with a vague purpose (or excuse) and take the adventures that are given to me. Once the adventures starts, I must make the best of things with the wits, resources, and equipment I have with me. Traditional macro photography with a tripod and long exposures was out because of the terrain (and to make sure that Julian didn’t fall off the cliff or start rolling in poison oak while waiting for me). While using the wind to create a blurring motion effect like I did in this photo might have been a possibilty, nothing I saw seemed to lend itself to the idea. So I turned to technology. The ISO of a camera determines the sensitivity of the sensor to light. The higher the ISO, the more you can take photos with a shutter speed fast enough to stop motion while keeping high depth-of-field. Setting a higher ISO is the digitial equivalent to choosing a film with a higher film speed (ASA). The downside of a faster film would have been more (and larger) grain; the comparable downside to a higher digital ISO is more noise. My Nikon D200 has a default ISO of 100, which is what I use most of the time. In the photos I took in Merced Canyon, I boosted the ISO by an order of magnitude to between 1,000 and 1,600. I also turned on a setting called High ISO NR. This is supposed to use the camera’s processing power to reduce the noise from using a high ISO. Based on these photos, I’d say it works pretty well. Raise high the ISO, digital photographic craftspeople, when the situation calls for it! Photoshop also provides filters to reduce (and add) noise, but from what I see these don’t work as well as using the in-camera processing at the time you take the photo. Just remember to reset the ISO sensitivity and High ISO NR when you don’t need them any more. Snow Plant, photo by Harold Davis. View this photograph larger. 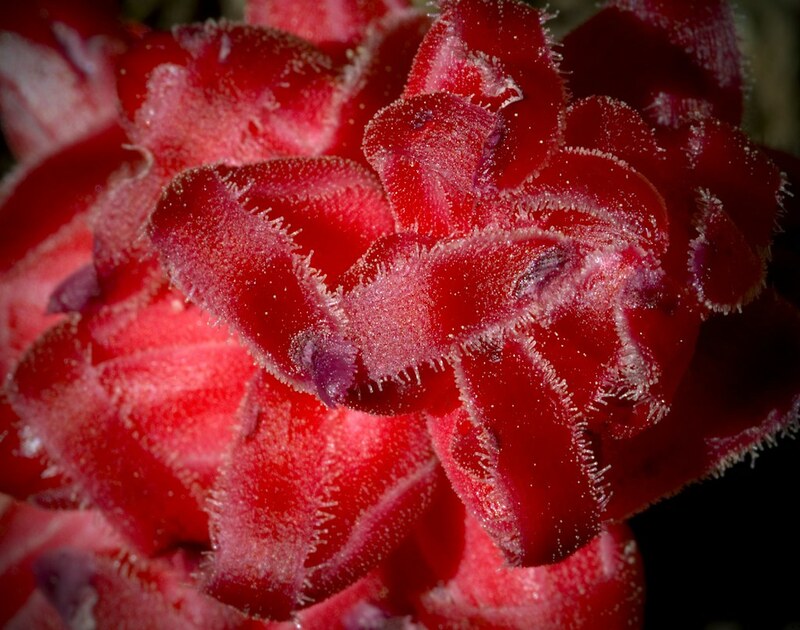 The snow plant, Sarcodes sanguinea, is really pretty amazing. 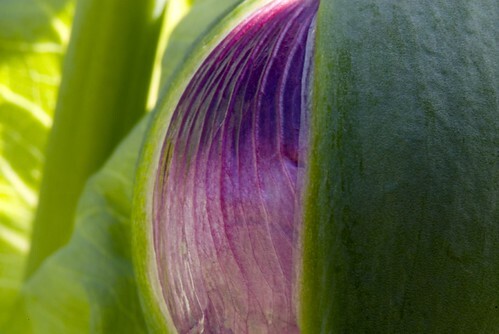 Coming up out of snow or forest undergrowth, it produces no chlorophyll. Without chlorphyll, it can’t synthesize sunlight. 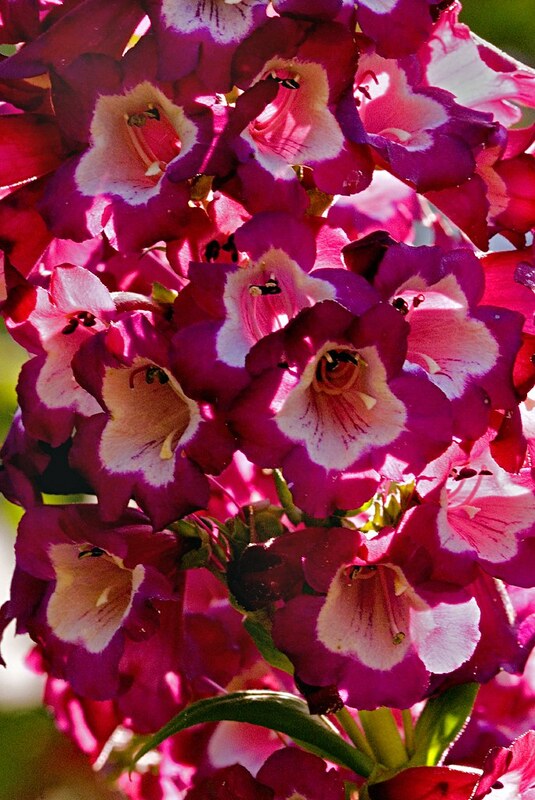 The lack of chlorphyll capability explains why this plant is red, not green. This snow dude relies on detritus from beneath the snow or on the forest floor to make its living. Julian and I came across this glowing snow plant as we were exploring Yosemite’s Wawona grove of sequoias. Photographed on-tripod with my 105mm macro lens in a shaft of sunlight hitting the forest floor at f/36 and 1/13 of a second. View from Moro Rock, photo by Harold Davis. View this photograph larger. It had been raining for our first two days in Sequoia, and Julian was getting “squirelly.” Well, I was getting squirelly too, but when an eight-year-old gets squirelly, he certainly lets you know it. We did everything we could do minimize the squireliness. We visited caves to escape the rain, and kept up outdoor activities. For example, we climbed the stairs up Moro Rock, actually a small granite dome like Half Dome in Yosemite or Tehipite Dome along the middle fork of the Kings River. Moro Rock may be smaller than these grander domes, but the panorama from the top of the Great Western Divide in one direction and the view out towards California’s central valley in other is immense. But not when the rock is swathed in rain clouds and fog. So we headed down under the earth for a tour of Crystal Cave, the last tour of the day. The Park Service has a bizarre arrangement where you need to buy the tickets for Crystal Cave in advance at the Lodgepole Visitor center, then dirve the hour to the trail to the cave. The half mile walk down to the cave is great, and the cave itself is beautiful (and great fun) if you get the chance. By the time we’d done the cave tour and walked back up to the car, the rain had stopped and the sun was casting radiant rays through the late afternoon clouds. I told Julian I was going back up Moro Rock. He complained. I told him he could stay in the car, wait for me, and read a book (it’s nice to have that option with him these days, reading is a very good thing! ), or come with me. He said, “I’m coming with you Daddy!” As it turned out, he had a great time, and I could hardly get him off the rock. One of the photographic challenges with a panorama as vast as the view from Moro Rock is to pick your portion of the view. There’s a natural human impulse to try to capture the whole thing by stitching together frames, or using an extreme wide angle lens, but of course no photographic technique actually recreates the tactitle senuousity of being on a narrow spur of rock high above the rest of the world with wind and clouds and sun rushing by on all sides. I thought this view to the southwest, with the great California central valley in the distance, and the switchbacks of Route 198 ascending to Sequoia on the right, was the most interesting segment of the panorama, mostly because of the interplay of sun and clouds. But digital sometimes doesn’t do that well with bright sunlight—highlights get blown out, and high contrast is an issue in landscapes. So I double-processed the RAW in Photoshop, effectuvely using one exposure for the sunlit clouds, and another for the darker landscape, combining the two with a layer mask and gradient. 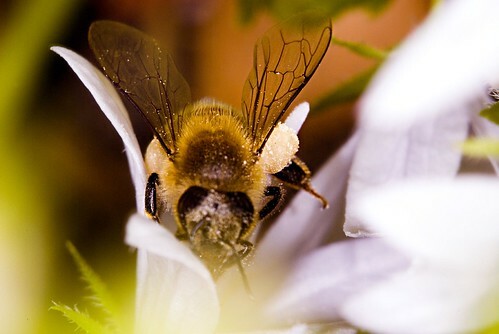 Be the Bee, photo by Harold Davis. View this photograph larger. I have been photographing bees in my garden in the warm sunshine of mid-afternoon. Nikon D200 + 200mm macro lens + 36mm extension tube + Nikon R1 wireless macro flash ring/kit. A very impressive-looking rig, and hard to move quickly. Autofocus flat out fails on a busy bee! It’s really tough to capture these bee dudes! Like hummingbirds, they just never stand still. It’s a challenge, and I’m going to keep at it! 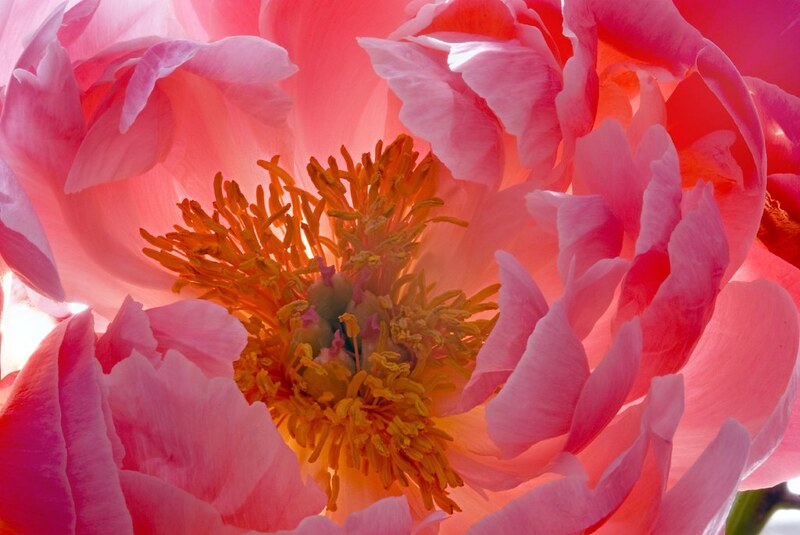 Peony Glowing, photo by Harold Davis. View this photograph larger. The peony above is a tripod-mounted macro using the late afternoon sun to backlight the photo, a spot light to add accent, and a fill-flash bounced in front. I had set the High ISO filter setting on my Nikon D200. I think this compensates remarkably well for the high ISO. You almost wouldn’t know that I’d gained an order of magnititude in possible shutter speed/aperture combinations—with very little trade-off in terms of extra digital noise (the modern comparable to more grain in faster film). Biggest, photo by Harold Davis. View this photograph larger. What do you do as a photographer when confronted with the biggest tree on earth, stretching up so high that it can’t possibly fit in a normal frame? I say one way to go is to use an extreme wide-angle lens, like the Nikon 10.5mm digital fisheye I used here. This lens is specially formulated for digital, and cannot be mounted on a film camera. It has no aperture ring, so f/stops must be set in camera. It projects a smaller image against the sensor to overcome Nikon’s 1.5X focal lens magnification factor—and still be truly wide angle. If one is lucky, the fisheye lens will even pick up a starburst effect from the sun, like I did here in front of the General Grant tree in Sequoia. By the way, I know Sherman was a great general, and succeeded in raising Atlanta and marching to the sea, but I’d have rather they named these wonderful trees after less warlike folk. Maybe the Martin Luther King tree? The problem with a fisheye photo, of course, is that for better or worse it will show the curvature distortion that is typical of extreme wide angles. Nikon attempts to combat this with a filter in their Nikon Capture software that is specifically designed to uncurve the curvature caused by this 10.5mm fisheye lens. Capture is really part of Nikon’s digital camera solution, and should be provided with higher-end Nikon digital cameras—and Nikon should give up trying to think that anyone will use it instead of Photoshop. Here’s another version of the photo of General Sherman run through the the Nikon Capture filter to correct the extreme fisheye distortion. I don’t think it makes as much difference as one might expect. However, I didn’t choose the option that said to correct areas where there was no image available. This would have had the effect of uncurving the image more (also, making the elements within it seem smaller), and I could have cloned in trees into the missing areas. Flowering Yucca, photo by Harold Davis. View this photograph larger. Driving down the dramatic road from Grant Grove into Kings Canyon, Julian and I descended through a gentle but steady rain. 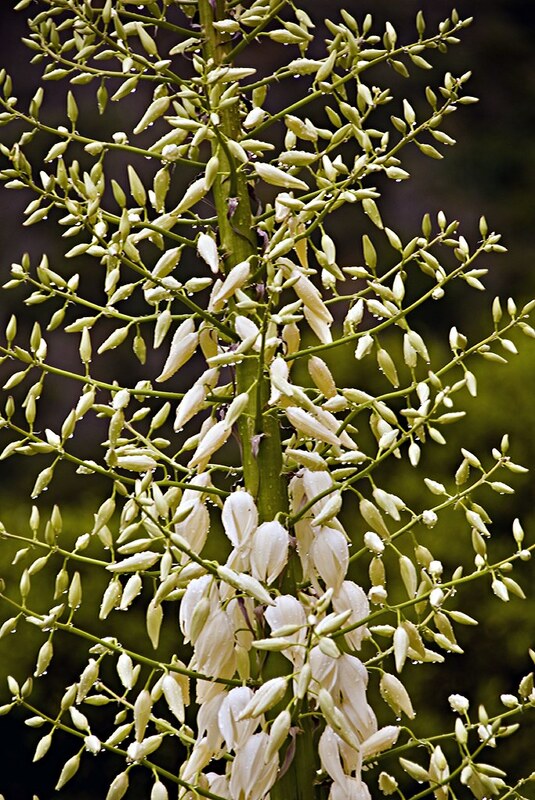 Above the confluence of the middle and southern fork of the Kings River we saw this flowering Yucca. It stood maybe twelve feet tall, decked with drops of water from the rain, over the edge of the immensity of the landcape. I mounted my camera on my tripod, as best I could sheltered it from the rain, and snapped this photo from the edge of the road with a telephoto lens. Drama Queen, photo by Harold Davis. View this photograph larger. It’s taken me a while to get to this photo, and I have quite a backlog, because Julian and I have been away in the Sierras in Kings Canyon, Sequoia, Yosemite. Stand by for photos! 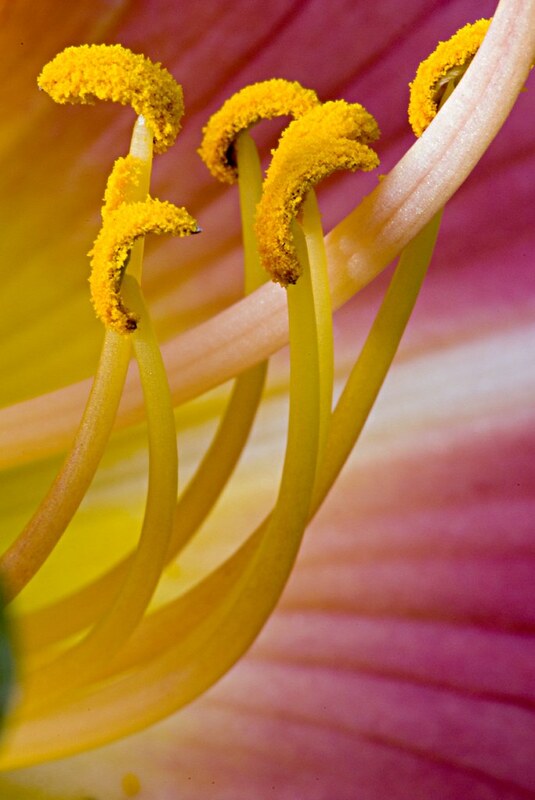 Luminous Day Lily, photo by Harold Davis. View this photograph larger. Luminous—emitting or reflecting usually steady, suffused, or glowing light. Surely this day lily from my side yard is luminous. A few days ago I was hard at work on a programming project. I promised myself a photography, er sanity, break at around 4PM. The light in our front garden falls into deep shadow at this time of year between 4:30 and 5, so that would give me a half hour or so of photographic fun. But 4 o’clock came and went, 4:30 came and went, and even 5 came and went, and I was still hard at getting something to work. So no break for flower photography. Later on I was whining to Phyllis about being chained to the computer and missing the light. 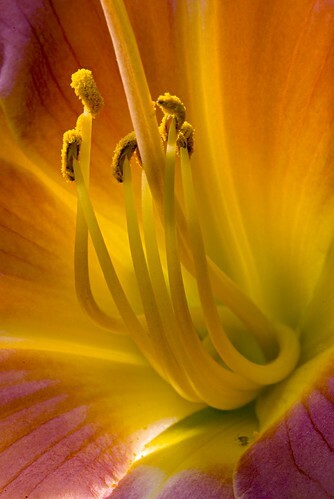 She told me to have a look at our side yard, where the last rays of the setting sun elegantly lit this day lily. As it turned out, I only had a couple of minutes to photograph the flower before the light disappeared. I did it in a very simple fashion, with my superb 200mm Nikon macro lens mounted on the tripod, the mirror locked up, and a remote cable. No extension tubes or other extreme macro funny business, just straight flower photos, unmanipulated in Photoshop except for RAW conversion and balancing the levels. 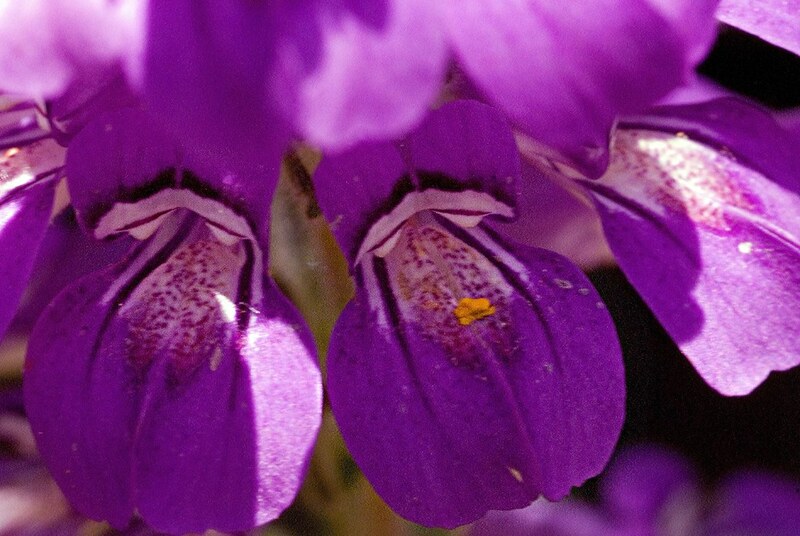 Note the little insect right below the center of the flower, and slightly to its right. Hard to see on the monitor screen even at the larger size, but he is very distinct (and cute) when I review the image at 100%. For the record, the screen rendering here is about 10%, and the larger size when you click the link might be 20%. These are large, 12MP photos. 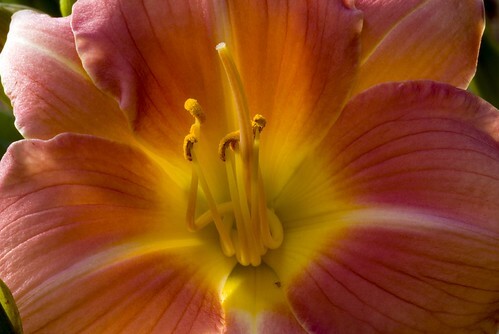 There are a couple of closer photos of this luminous lily below. Meanwhile, I wanted to note that I am taking Julian to Yosemite and the Sierras. It’s great to have my eight-year-old enthusiastic about hiking and wild places (he says he wants to be a “mountain climber” or a “hiker” when he grows up). 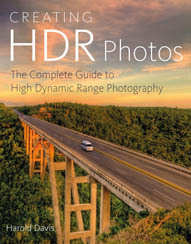 I also will be shooting some final photos for my Photographer’s Guide to Yosemite and the High Sierras. Here’s one of the photos from one of our trips together this last winter. The good news: Julian and I will have fun, and I’ll come back with some good photos (I hope). Bad news: no new Photoblog 2.0 entries for a week or so! Garden Sculpture, photo by Harold Davis. View this photograph larger. Some people have bird baths, plastic gnomes, wishing wells, or pink flamingos in their garden. 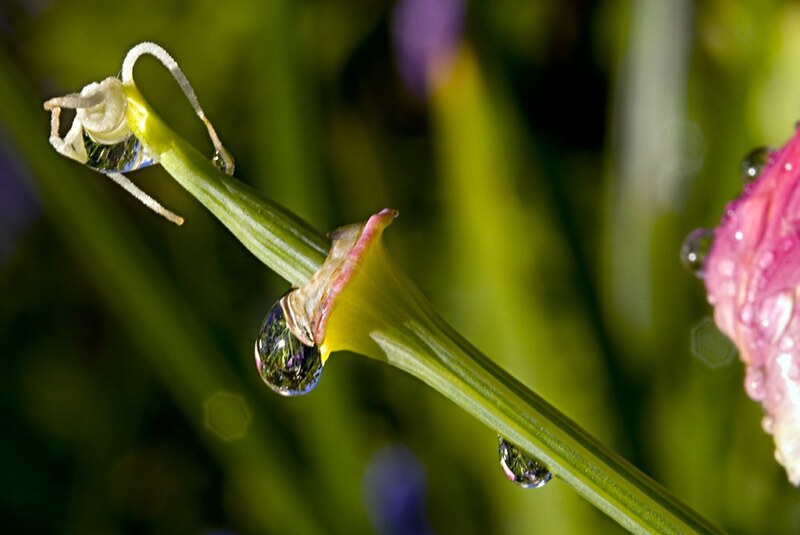 We have this remains of a Purple Gleam poppy, many flowers, laughter and kids, and water drops. Wing, photo by Harold Davis. View this photograph larger. Looking at this apparent celestial meteor through my macro rig, I wasn’t sure what had fallen to earth. Actually, it is the wing of what we call a mosquito eater, an insect that I found in our bathroom. This insect is also called a “Daddy Long Legs,” and (with a bit more precision), “Crane Fly,” Tipulidae oleracea. 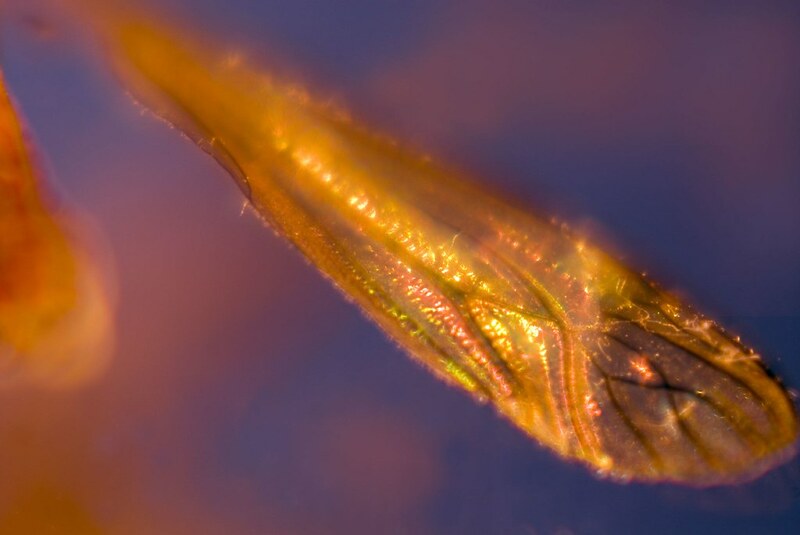 Though it is a fly, it is quite benign (as well as beautiful)—and far too spindly to be in any danger of being fed to one of our carniverous plants. This photo was shot through my 105mm macro lens with 64mm of extension tubes and a +4 diopter close-up filter on front. I did various versions, but this one was as wide open as I could go at about f/6 and one second. (At least I didn’t have to consider motion, as the poor creature was dead and this was indoors.) The more stopped-down versions with higher depth-of-field weren’t as interesting to me as this version with the meteoric, fell-to-earth lighting effect. Worlds without End, photo by Harold Davis. View this photograph larger. Everytime I point my lens at water drops on a spider web, I think of worlds within worlds and the multiplicity of possible worlds that there might be. I took this photo today while on break from other (less fun) pursuits near the side of our house. Well, from debugging code if you must know. 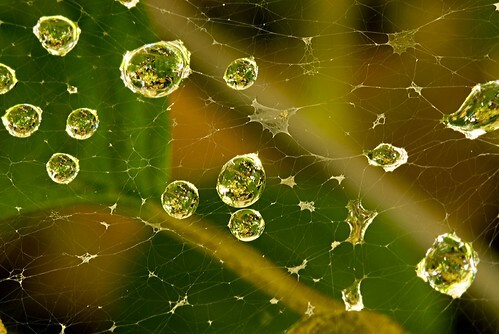 The image reminds me of an earlier photo of mine of water drops and a web.